Entrust Datacard offers mobile-enabled, two-factor authentication solutions that provide your users with one trusted identity for all of their authentication needs. Our solutions combine strong authentication with bold enablement. We utilize the convenience and ubiquity of mobile technology to allow you to authenticate trusted identities without compromising usability. Our two-pronged approach involves first securing a user’s mobile device, then leveraging it to improve security – an effective method to reduce business risk and improve the user experience. Mobile and cloud have transformed the way we do business. Security parameters are changing, applications are multiplying, and user expectations are increasing. As digital business evolves, legacy two-factor authentication – such as passwords, grid cards and hardware tokens – no longer provides adequate protection against unauthorized access. Today, a foundational element of your success relies on trusted identity. 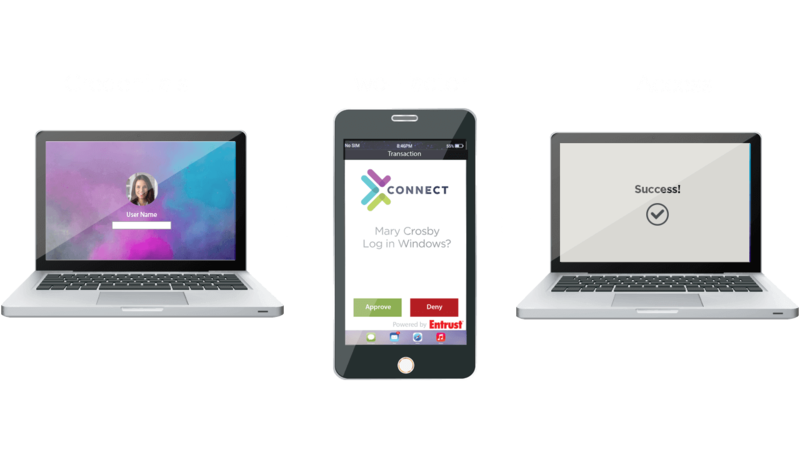 Two-factor authentication (2FA) is a security method used to verify a user’s identity in order to provide secure access to networks, applications, cloud services and physical buildings. It provides stronger access security because it requires two methods (or factors) to confirm a user’s identity. Our modern approach focuses on secure mobile identities and behavioral biometric solutions to provide high identity assurance without compromising usability. Our solutions employ adaptive authentication methods to provide a secure, transparent user experience by enabling step-up authentication when a user has been identified and elevated as a potential risk. Our approach utilizes device reputation, transaction analytics and behavioral biometrics to anticipate and adapt to threats in real time, providing strong security without creating friction for your users. Device reputation recognizes and detects fraudulent behavior across all types of Internet devices – including desktop, mobile and tablets – and then employs additional step-up security measures when necessary. It can even detect risks prior to login, and it integrates with both websites and applications. Forrester unveils insights from 100 IT and IT security executives regarding their approaches to and challenges with user authentication and access management. Our portfolio includes on-premises, virtual appliance and cloud-based authentication solutions, providing you with one trusted solution partner for all of your authentication and identity-assurance needs. Our commitment to continuous innovation means we will work with you to guide you and help you create a highly secure, yet user-friendly digital enterprise. Passwords can no longer be trusted to protect your business. Not only are they easy to compromise, but the manner in which people manage them makes them more vulnerable. Our solutions allow you to move beyond passwords to a more secure approach that fits with the way people prefer to work. Our authentication platform provides a single management solution for issuing, provisioning, managing and authenticating the digital identities of users and devices — across a broad range of use cases. While you may only have one need today, our solution can grow with you as those needs change. Mobile-enabled authentication allows users to access networks and buildings, collaborate with peers and communicate securely — using the devices they carry today. Our solution offers strong security and ensures high accessibility for authorized users. Leveraging mobile eliminates the need to purchase dedicated and often costly hardware tokens, and it simplifies user provisioning and management as users already know how to download and update mobile applications. The broad range of Entrust Datacard self-service features makes enrollment and activation easy. Apply encryption, digital signature and certificate authentication consistently across a range of applications and platforms with Entrust Authority PKI.